Sometimes squash can be intimidating. They are weird looking, require a huge knife to hack them open, and then take hours in the oven to roast and soften. 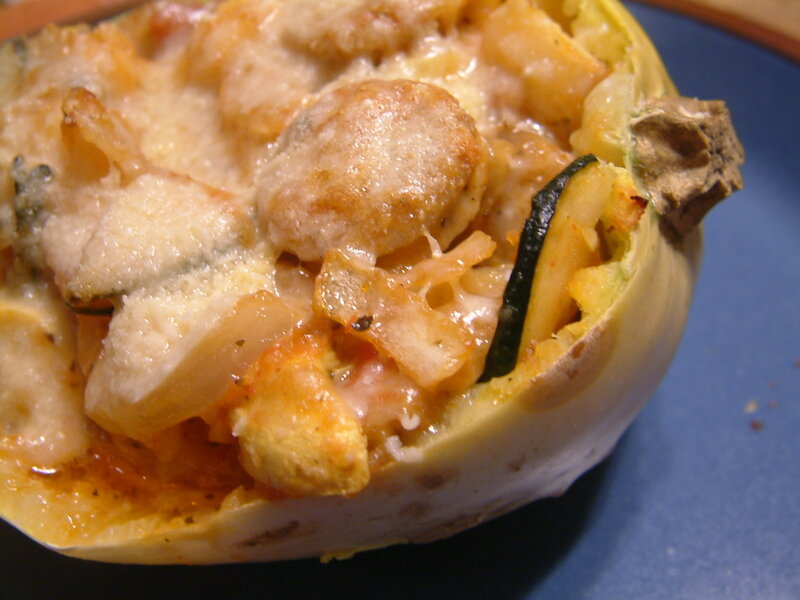 Spaghetti squash are the smoothest of the squash family. Their flesh, when cooked, breaks apart in strings not unlike angel hair pasta. But don’t be fooled. It is still a squash. I just learned a great squash trick. You can soften a squash in 8 minutes in the microwave. Yes. Just halve it, scoop out the seeds, cover it in plastic wrap and nuke for 8 minutes. You’ll want to let it rest a bit so you don’t scald your fingers when you remove the plastic wrap. I know. Something about “plastic wrap” and “nuke” doesn’t seem quite right. You can always pop the squash into the oven for about an hour at 375 degrees F. face down on a rimmed baking sheet with a bit of water. Up to you. I rarely have the patience to wait an hour for my dinner by time I get home, especially if it is a night after swim practice. I introduced spaghetti squash to my friend Summer the other night, who has just moved to New England from Southern California. He was handy for wrestling open the squash and when he had scraped his dinner clean I told him that sometimes people wear the skin as a hat. If Summer looks particularly reverent in this photo, it is not because of my cooking. If you look carefully, you’ll see that the face of Jesus appears in the burn marks of the squash! This photo has not been altered in any way. If we had our wits about us, we would have sold it on eBay. 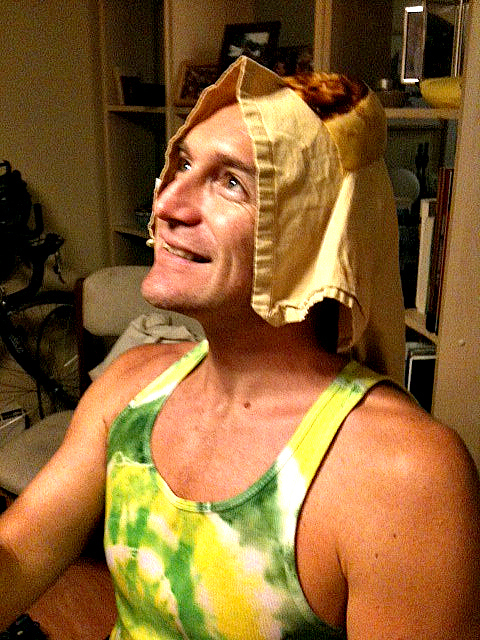 Unfortunately, the Spaghetti Squash Jesus Hat sits somewhere in a Boston landfill. A few days ago, I spotted a 2 lb. spaghetti squash at the corner market, a perfect size when cooking for one. So when I had just a half hour for dinner on Wednesday before I needed to be out the door I knew it was a good night for stuffed spaghetti squash. The other culinary quick step I’ve been enjoying lately is Italian sausage. It’s an easy-to-cook menu item that adds flavor and can be portioned without a lot of fuss. While the squash was spinning around in the microwave I cooked up onions, garlic, zucchini, summer squash, apples, and an Italian sausage on the stove top with some dried sage and marinara sauce. Then I added the squash, put the whole thing back into the squash skin, covered in it freshly grated cheese and popped it in the oven. About 15 minutes later, dinner was ready. It was delicious, warm, and had all the best flavors of fall. You can substitute whatever meat and vegetables you have on hand, ground beef for instance, or green bell peppers. Halve 2 lb. 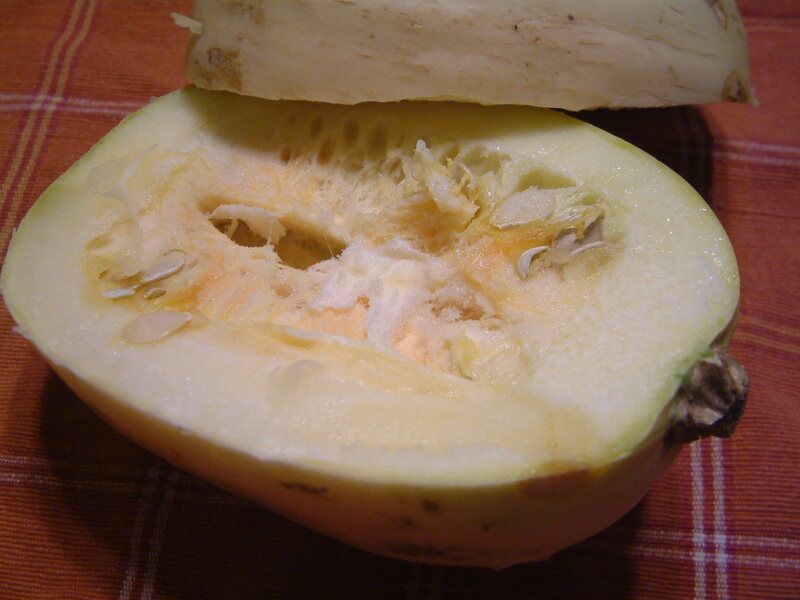 spaghetti squash, scoop out the seeds, cover in plastic wrap. Cook on high for 8 minutes. Let cool. Meanwhile, in a pan on the stovetop, heat butter and cook onions and garlic until translucent, about 4 minutes. Add sausage and cook. As the sausage begins to brown add zucchini, summer squash, apples, and sage. Stir until well heated. 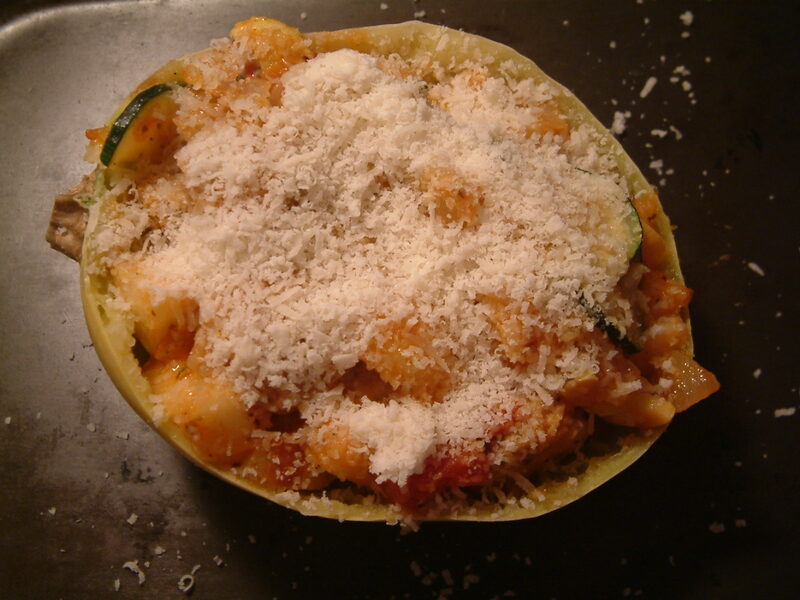 Scoop out the softened spaghetti squash and add to pan. Add marinara sauce. Stir until heated through. Place contents of pan into the now-empty squash skin. Cover with grated cheese and cook about 15 minutes until cheese is melted. Serve immediately with apple cider. I have seven spaghetti squash from my garden I just picked. I needed a new idea for preparing them. This looks like a fabulous recipe. Yum! Yay! Such a fun idea! How do you serve this? Is thing a single person for one person? And do you eat the squash too or just the spaghetti? This looks scrumptious! I just introduced a couple of the girls in my dorm to the wonderful quick meal of spaghetti squash. I usually just nuke it for 10-12 mins and melt a little Brummel and Brown’s yogurt butter and some Parmesan plus a little sprinkle of salt and pepper. I’m giggling, but this really does look delicious! Kendra, I made a vegetarian (sorta, except for the cheese) version of this dish. I used soy Italian sausage and all the herbs. One half was great as a dinner for one! I saved the other half for another dinner! Your way to cook the squash was perfect. I have a 700-watt microwave, so I cooked the 2 halves for 10 minutes and then let them cool. Scooping out the strands was easy. Next time, I’ll use Trader Joe’s vegetarian meatballs and Marinara sauce and make spaghetti and meatballs. Will use the same spices. Yum!